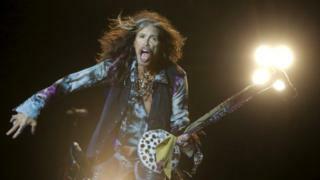 Aerosmith star Steven Tyler has asked Donald Trump to stop using his band's song Dream On on the campaign trail. The singer's lawyers have sent a cease-and-desist letter, saying the use of the song "gives a false impression" he endorses Mr Trump's presidential bid. The politician has been playing the power ballad all summer, even air-drumming to it at a rally in Las Vegas. Tyler, who is a registered Republican, says it is not a "personal" issue but one of permission and copyright. It is the third time a musician has confronted Trump about using their songs to promote his presidential bid. When the businessman announced his candidacy, his campaign played Neil Young's Rockin' in the Free World - an angry response to presidency of George Bush Senior. Young, a well-known liberal, demanded that Trump stop using the song and declared his support for Democratic candidate Bernie Sanders instead. Trump's campaign responded that "despite Neil's differing political views, Mr Trump likes Neil very much." He then used REM's It's the End of the World as We Know It (And I Feel Fine), prompting singer Michael Stipe to issue a strongly-worded statement, saying: "Do not use our music or my voice for your moronic charade of a campaign." Conversely, Tyler is not politically opposed to the billionaire, who is the current frontrunner in the Republican race for the White House. The singer even attended the second GOP (Grand Old Party) debate in August as Trump's guest, according to the Washington Post, but his representatives issued a legal letter to Trump's campaign over the weekend. "Trump for President does not have our client's permission to use Dream On or any of our client's other music in connection with the campaign because it gives the false impression that he is connected with or endorses Mr Trump's presidential bid," the cease-and-desist letter read. "If Trump for President does not comply with our demands, our client will be forced to pursue any and all legal or equitable remedies which our client may have against you." Trump was initially asked to stop using Dream On, which features the refrain "dream until your dream comes true" after a rally in Alabama two months ago, but he has continued to use it on the campaign trail, reports Rolling Stone. Representatives for his campaign did not immediately respond to request for comment. Politicians using songs by musicians who do not support them has been a thorny issue for decades, since Bruce Springsteen castigated President Reagan for planning to use Born in the USA as a backdrop for his 1984 re-election campaign. Technically, US copyright laws give politicians carte blanche to use recorded music at their rallies - as long as the venue has a public performance licence issued through a songwriters' association such as ASCAP or BMI (in the US) or PRS (in the UK).